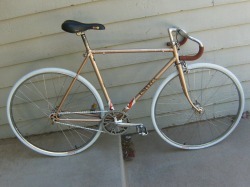 This is a sweet single speed bike set up for cruising around - classic styly, yet so simple - such a great ride. It is approximately 50 cm c-c on the seat tube for a steel is real frame. It has new tires and is set up with some bull horns for the cool hipster look. It will ride very nice and is light weight. Rock it baby! 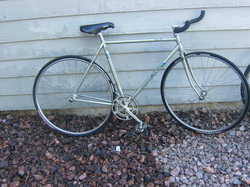 This is a great touring bike - made from steel is real for a super smooth ride. It has a triple crank for the high mountain passes, and is capable for putting racks on it for hauling almost everything. Great tire clearance and canti brakes make it ready for fenders, or big fatty tires. 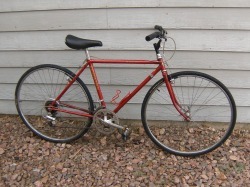 It would also make a very awesome commuter if you are a Fred. It is a pretty smal frame, measuring approximately like a 50 cm. Nice new Bontrager tires are on it and it is ready to ride. This is an awesome bike with some great style to it. It is abuilt for the smaller crowd, as it is probably a 52 cm frame (again we with update the size when we put a tape measure to it). Steel frame as always, with some classic Schwinn lettering from back in the day when it was cool to have a sweet Schwinn. 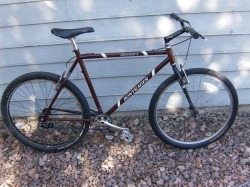 It has flat bars with a nice sweep and chop to them for sneaking in and out of traffic during an alleycat or delivery. Come and snag it as it will be gone fast. 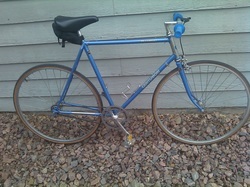 This is one cool old school ride in super great shape single speed. As always, a steel is real frame - probably about a 57 cm (we will update with information when we put our measuring tape to it). 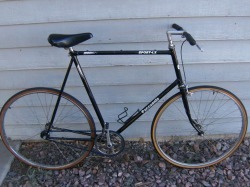 This is your perfect commuter bike, grocery getter, bar cruiser or just general in town rip it up old style bike. 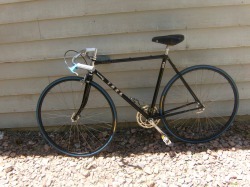 It has flat bars and some new grips for that sweet hipster look. 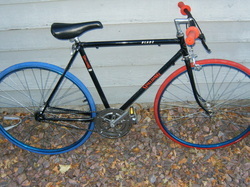 It is an easy rider with an awesome fixie look to it. 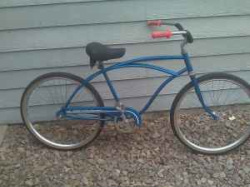 The Beach Boys would be rockin and hoppin to the bars on this sweet Huffy Good Vibrations cruiser. 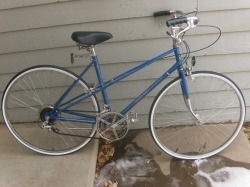 New tires and chain make this a smooth ride and would make a great bike to join in on the Denver Cruiser rides - or it would even make a great grocery getter. It is not the correct photo - we are working on that. This is a sweet old school steel roadie that we did not make into a fixie or single speed as it was just too cool to change. 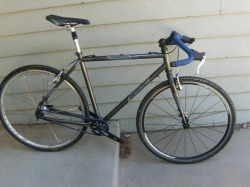 It is a Performance bike with a lugged steel frame, Shimano components, indexed down tubies, and some Contis. It is set up for a tall boy, as it is about a 60 cm c-c on the seat tube. This bike would be a great commuter, or for somebody that is getting into road riding. Super solid and super comfy. WOW - is just about everything needed to describe this bike. 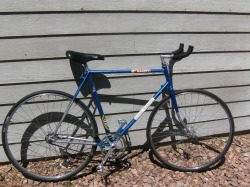 It is a blue Bridgestone RB-2, steel, 60 cm c-c framed bike that is in pretty awesome condition. Some of the decal paint is peeling away, otherwise it is sweet. It has Conti tires, mid level shimano components an Ultegra/Mavic rear wheel, Gipiemme front wheel and a torn up Avocet seat that we will be replacing. We will also be putting on some new handlebar tape as soon as we can. This is one of the classics for a great price, so grab it while you can. This is a 54 cm (as measured by Trek) Madone. 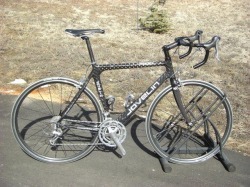 It is all carbon and about as slick as it gets - Full Ultegra drivetrain, it is a triple for your climbing pleasures. It was owned by a co-worker at my dad's shop and we are selling it for him. It has very few miles on it, and upgraded wheels - Mavic Ksyriums with Specialized Armadillo tires. I don't know if Giant would be the proper name for this bike - as it is a smaller frame size - but rides like a big dog in the pack. 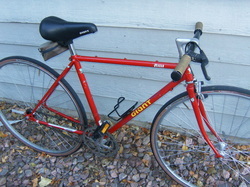 It is a steel frame Giant Quasar that would fit somebody in the size range of 5'-0" to 5'-6" or so. It is a 48 cm c-c on the seat tube measurement. It has a nice set up, with the never get a thorn flat Armadillo tires, Sugino Cranks and some lock on grips on some flat bars with a tiny bit of sweep. 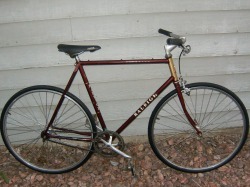 It is set up as a single speed and is perfect for the cruise around town. As many of you know - I race for a team called Seek 1 Racing and from time to time, I sell a bike to raise some money for my race team. 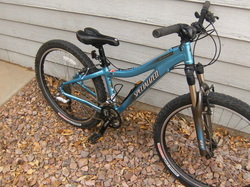 This is one of them - It is a Specialized Hardrock Sport. 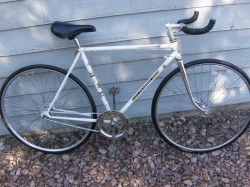 It is in great shape, looking like it has been barely ridden. It is an XS and would make a perfect Christmas gift, as well as help out my race team. It has an XT rear derailleur and some Truvativ Iso Flow cranks on it and rides really well. This is a great steel is real bike built for just about any type of riding you would want to do with it. It is a 57 cm c-c on the seat tube size. Right now, the bike has some Conti's on it for some road touring, but with canti brakes, it will easily fit some cyclocross tires to make it a go everywhere bike. It is set up with a very low geared triple (3x7) and has Shimano RSX STI levers that work great. The bike is clean, has a great looking frame and new Bontrager saddle. It would also be perfect for commuting, with a great ride quality. Wanna race, probably not this bikes cup of tea, but still will work for just about every other thing. This one will sell quickly. 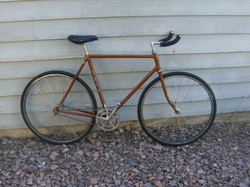 Here is a cool single speed that is not all that common. It is a Kabuki steel frame, made by Nissan. We are guessing that it is a medium sized frame and measures out to a 53 cm. 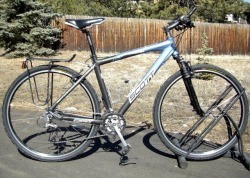 It is great for cruising around town on with its nice flat bars and has some flashy new white wall tires on it. It could easily be turned into a fixie with a flip flop hub. This bike just looks like and is completely inspired by the old skoolflat track motorcycle races. Not sure if they are still around, but this bike will certainly make you think of a nice Honda Ascot with its flat track bars, steel frame and a little bit of cheesy flash. 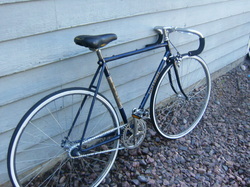 It is set up as a single speed, rolls nice and is an overall great bike. This bike is pretty much a medium size, measuring 53 cms on the seat post. Built for those 6-foot (give or take a few inches either way) bike polo players, this is a Miyata single speed steel framed 61 cm c-c on the seat tube steed. It has some chopped flat bars, new BMX grips that are super comfy, and new rubber to round out the package. Nice Coda saddle. Great for the bike polo game, or just cruising around town. It would even make a great commuter. 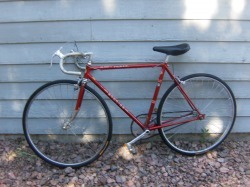 This is a great Chicago made Schwinn Passage that is set up as a cyclocross bike - although the photo has it looking like a townie. Cruise the street/trails or whatever in style on this fine steel 49 cm c-c frame. It is set up with 105 shifters, Dia Compe canti stoppers, and Shimano Derailleurs - good stuff that works great. Some nice comfy drop bars with some new Lizard Skin Moab grips make it a great ride. Contis round out the package. This bike makes a great commuter, or cruiser for running around town on. Get the Chi Town class as it rocks like REO Speedwagen!!! Go big with this beast of a fixie - it is made for a big boy - measuring our as 64 cm c-c. 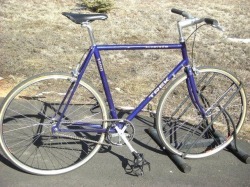 It is a steel, lugged frame made by Raleigh, and it is the Super Course model. If you have some long legs, this is the bike for you - rock it out! This Trek 720 steel frame is set up as uber cool as it can get. A total uber urban cross bike with cross top levers, canti brakes, Bontrager tires and track grips. And for that shifting ease - yep - it's a single speeed - as all good cross bikes are. Sweet new neon chain matches the trim on the frame as well as the bottle cage. This one will not last so grab it quick! 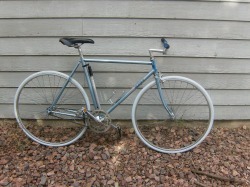 Here is a great single speed that has a great ride quality to it. It is a steel 55cm frame that is set up to cruise and look as cool as can be. New white wall tires are great looking and it has a cross top stopper giving it the super hipster look. Rock it out on this one! 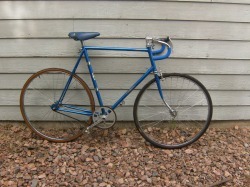 So here is another big boy bike - it is a Motobecane Grand Sprint - set up as a fixed gear with a Surly track cog. This is a 61 cm c-c seatpost lugged steel frame. Good looking Kenda White walls, some Bobke Prayer Stix and Bontrager riser bars make this a comfy as well as stylish bike. So snag a large order of bacon to cruise the streets on! 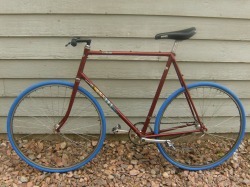 What a sweet fixie! This is a great looking Puch bike - which is set up for a smaller rider - as it is a steel frame - 51 cm c-c. 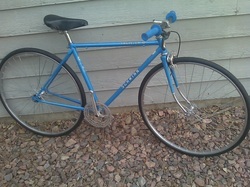 Specialized tires make it an awesome rider - Come and Puch yourself with this awesome fixie - it is so worth it! Here is a Browning - and we thought that they only made guns - fixie - set up as a sunshine special - yep - it is yellar alrighty now! 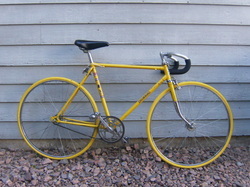 What you are getting is a great lugged steel frame - 56cm c-c (seat tube) with some flashy Kenda yellow rubber. While we would say that it is not waterproof, it sure looks it with the sunshine yellow. A Sury fixed gear cog and some cool SR cranks kinda pinned are the drive train. We thought it would be overkill to include a yellow chain. so it is a plain one! Get this bike as it is definitely a one of a kind! 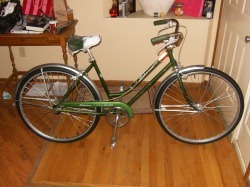 This is an awesome 56cm steel ride made by Schwinn. It is a World Sport and has some Contis to cusion the ride. We have it converted to a single speed - because one gear is all you ever need. 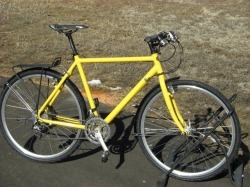 It is a great riding bike and would make a great bar hopper, commuter, or whatever you need it for. It comes with new bar tape that is not shown in the photo. Come and snag it! So this Trek Fixie is about as awesome as it gets - It is a steel is real 57cm frame set up with a 16t Surly track cog as a fixed gear bike. The brown flake paint glistens in the sun. Some 700c x 28 Kenda tires and foamie grips on custom chopped bars give it a Charmin soft ride quality. This is a sweet beast - grab it as it won't last! This is one of our new babies - and it is about as good as it gets. It is a new Origin 8 steel cyclocross frame (53cm) built up with some great parts. There are so many possibilities to this frame, that you can decide what you want to do with it. It has disc tabs, track drops, a der hanger for gears - you name it. Here is how we built it up: we have Origin 8 levers that pull Tektro Mini V's stoppers, nice Origin 8 bars with Lizard Skin wrap that are super comfy, a single speed drivetrain with a Bontrager Lite rear wheel and a Shimano 500 front - both with Maxxis Raze cross tires, and a Bontrager saddle on a shock seatpost for the smooth ride. This bike can go anywhere and can be used for anything. WeFixie has a great special bike for that special someone - Thie is a Peugeot Mixte cruiser that is very nice looking and has some great stuff on it as well. It is powder coated blue with some nice sparkles covering up the smooth riding steel frame - way cool. Stoppers are your famous MAFAC Racers that are so ever popular. It is a great riding bike and definitely a nice cruiser!!! Grab it quick!!! 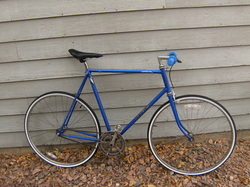 This is an awesome ride - it is a steel framed 54cm Univega single speed that is set up to cruise the town. It would also work great as a commuter. New hospital white rubber tires (no we did not snag them of grannie's wheelchair - but they are that cool), a nice Selle Royal seat that is super comfy, track grips and cheater brake lever make this super nice. This is sweet!!! This is a screaming deal on a great mountain bike. It is a Motobecane Phantom 29er with Deore shifters and XT rear derailleur. The stoppers are Avid BB 5 discs and it is screaming with a Race Face Evolve XC cranks that have the outer bearings and is solid as can be. WTB disc hoops on Formula hubs. Titec bars make the cockpit real comfy, as well as the Specialized saddle. The color has a nice anodized red look that makes it look much more expensive that what it really is. The frame size is a 19. It has a Rock Shox Dart for some front squish action. 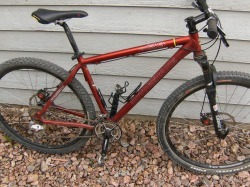 You should not find a better deal on a mountain bike than this. This beast is so ready for the polo grounds - or off to the tennis courts for some bike polo - it would also fit in well at the country club, or whereever you just want to be the hippest. 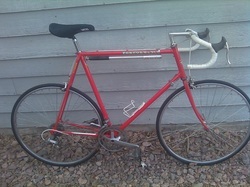 It is a Raleigh Technium - which is a lugged aluminum frame - nice and lightweight - and in great shape. It is a 55 cm c-c on the seatpost. Nitto riser bars and stem are super comfy, as is the Specialized saddle. The whits tires make this super unique. New chain and Surly cog with a Sugino crank drive the masher. Snag it quick, because this one will be gone fast. Novara Randonee - $200 - Go Deep!!! Go Deep - or at least go far on this set up for touring big time steel is real Novara Randonee. It is a big boy bike, measuring in the area of a 61cm c-c on the seatpost. 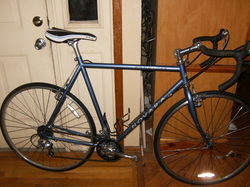 This bike can be used for several things, such as long rides, commutes, and some crazy type touring and will work well. This tall kids bike - measuring about 61 cm c-c on the seatpost is an awesome, solid ride. 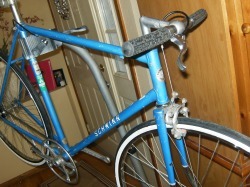 It is a Campania bike, which is about the lower shin of Italy. It is a great riding steel is real lugged frame. The seat could certainly be replaced with your preference as there is a small tear in it. Nice track grips and a single simple stopper round out the package. Commute all around on this great riding Novara Corsa. 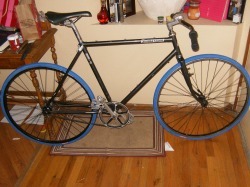 Great riding frame with some new blue CST tires make it stand out as an awesome ride. Flat bars for some sleek style. This is a taller frame and built for someone about 6 foot or so - come and grab it. 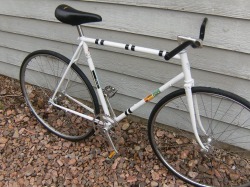 Kick of the summer with this great riding Raleigh Olympian single speed. It is a 57 cm c-c (seat tube) steel is real frame dressed up with some nice riding features, such as a Selle saddle, some swept back bars and some new rubber. 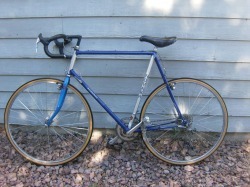 Comfy, classic and fun to ride - it would make a great polo bike, or work well as a commuter bike. Enjoy the summer on this sweet ride. 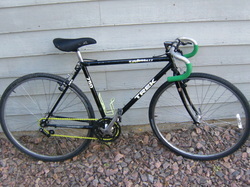 This is a Trek Elance steel framed bike converted into a single speed. Some flopped cruiser bars make it look old fashioned, but also have a great ride quality, and it is very unique. The frame size is a 53 cm c-c on the seatpost. This bike was made well before that Lance guy that rides a Trek ever started tweeting - so you can be super original, yet still ride on quality to back it up. This cool ride was stripped - then some rattle can was added to dress it up, as well as some fun stickers, such as the Bear Naked and Wahoos Fish Taco's ones. It make is a fun looking bike, as well as a good riding bike. 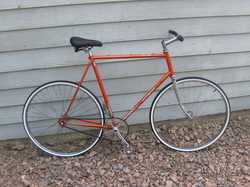 It is set up as a suicide fixie with no brake - and measures about 56cm on the steel frame (c-c seat post). The rubber is pretty new - there are still little hairs on it and it has a Sugino crankset. This baby will move fast - so grab it quickly. Set up with "customized pursuit bars" - ok - so the are basically chopped bars but they look great. Nashbar touring frame, 56 cm, extra long chain stays for heel clearance, rear rack included, full shimano XT components including custom wheel set, crank, derailleur, shifter/brake levers, 3 x 9, complete tour/city bike with fenders and 700 x 35 rims/tires, ready for the miles, aluminum frame and chomoly fork, lugs on fork and 3water bottles. This cool gem is a steel is real Peugeot frame - probably close to a 54 cm c-c (Sorry, the snow in May made us forget to measure it and retreat to warmer quarters). It has some riser bars on it and a pretty nice look with some illegal pete stickers that we found somewhere. New tires and some rattle can really spice it up as well. 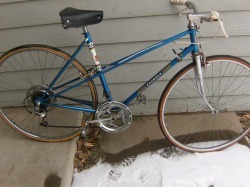 Get this baby soon for the cruiser rides which are starting as soon as it is not so frigid. We have had a few of these - I wonder how many have been made - but they are way cool! This is another Peugeot fixie we have built up - It is a steel is real frame set up measuring 53 cm c-c so it is about a medium. New flashy rubber is on it, as well as some chopped pursuit bars. 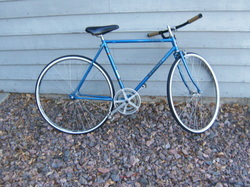 It will look awesom playing the game of bike polo - or doing the cruiser ride - be a hipster on it!!! 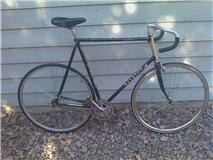 This is a classic Bontrager Privateer, made out of steel with some way cool stuff going on. It would be great for that simple life of mountain biking or even as a great looking townie. It is pretty big, made for somebody about 6 foot or maybe even a hair larger. It is a full rigid set up and had a Surly Flip Flop hub on it as well as a chain tensioner. Old school XT cranks and Race Face bars give it a vintage MTB look. This should be hangin out in Crested Butte baby! Snag it and be the envy of all your pals in the MTB world. This is a beautiful bike - set up with old skool brakes and has now been converted to a fixie, This Trek is a great old skool townie. Nice 700 c wheelset that will fit just about any type of tire you would like on it. The frame is in great condition with a cool sparkle grey paint job, highlighted by the sky blue decal and trim work - It is a steel 53 cm c-c frame. Nothing wrong with this bike - well except that somebody put some Onza bar ends on it - we dropped the price from $3000 to $250 because of that for uncoolness. Again, easily removed and then the beaut is back in the high end zoot range!!! Here it is - a high roller. This may be the biggest bike we have ever seen - other than a Penny Farthing. It is a 65cm center to center steel frame and is built up for a big person. We have made it a single speed and it is ready to roll. 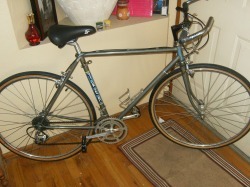 It is a nice Panasonic Sport lugged steel frame - If you are tall, buy this - it may be the only one around!!! 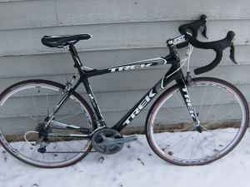 Single speed with flip flop hub, both wheels Vuelta, brand new - Shimano brakes - This is one of Treks great Aluminum frames that is super light and yet provides a great quality ride. This is a great bike - super clean and super nice - steel great riding frame, with some new white walls that class it up a bit. Yes Martha, it does have gears on it as well for that easy of climbing capitol hill downtown - or wherever you may be heading. It is a Custom Sport. Christmas priced to move quickly! Bridgestone, back in the day, made about the best bikes around. Super high quality frames that were set up to ride everywhere. This is probably the coolest fixie we have had the priveledge to work on. It is sweet. The MB-3 frame is 54cm c-c for the seat tube, 55cm c-c on the top tube, and has some great lugs to go along with its subtle bass boat grey finish. Some nice looking blue CST rubber brings out the shine to it, as well as the stock SR MB made for Bridgestone bars set up in a drop position. Solid stock SR stem looks like it came from the BMX world, but was stock on this beast. The Sugino cranks have a built in chain guard - another nice touch. Comfy Fizik saddle. This bike will certainly be at home for bike polo, the commute to work, or the downtown cruise. Don't miss out on this one of a kind classic!!! This bike is da bomb - set up as a fixie with some cool whitewall tires - it is a 57cm c-c steel Schwinn frame that has the Madison poser look. So, in other words, it looks alot like some of the cool Madisons, but it is not. Still, it is a great riding bike with some nice stuff going on - such as chopped Schwinn bars, and a crosstop lever to help slow you down, as well as some Bobke Prayer Sticks to hold onto. Will fit into the tiniest of alleys for your allecats! This is too cool for skool - a women's Schwinn Collegiate Cruiser. It has a nice old skool look that will fit right in on any campus. Bring back the glory days of riding around campus, takin in the English 101, while trying to coffee load to stay awake during those mono-tone professors. 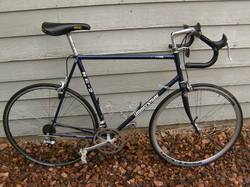 This is a steel women's frame, with many original parts still aboard. 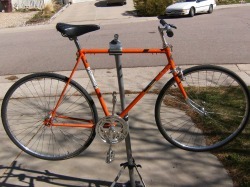 It has been set up as a single speed for simplicity, and has new rubber to make it a smooth ride.